Burkina Faso’s military dissolved parliament and announced a transitional government on Thursday (30 October), after violent protests against President Blaise Compaoré, but it was not immediately clear who was in charge. Army chief General Honoré Traoré said the new government would be installed after consultating with all political parties, and would lead the country to an election within 12 months. He also announced a curfew from 1900 to 0600 GMT (1500 to 0200 ET). 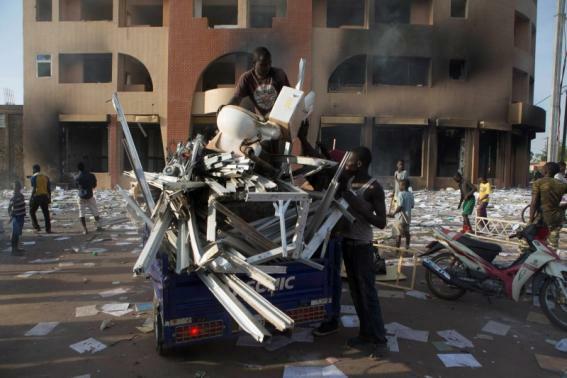 The move came after tens of thousands of angry protesters packed the streets of Ouagadougou on Thursday to demand Compaoré’s departure, storming parliament and setting it on fire and ransacking state television. “Given the need preserve the country from chaos and preserve national unity … the National Assembly is dissolved, the government is dissolved,” Traoré told a news conference. However, he declined to say whether Compaoré, whose attempt to extend his 27-year rule has sparked months of tension in the landlocked country, remained the head of state. Regional West African bloc ECOWAS had said earlier on Thursday that it would not accept any party seizing power through non-constitutional means – suggesting diplomatic pressure to leave Compaoré in place. Before the military’s announcement, the president had issued his own statement announcing a state of emergency to be enforced by the army and calling for talks with the opposition. The protests were sparked by the government’s attempt to push a constitutional change through parliament to allow the 63-year-old president to seek reelection next year. Large protests also erupted in Bobo Dioulasso, Burkina’s second biggest town, and Ouahigouya, in the north. In the capital, the crowd faced off with security forces outside the presidential palace in a tense standoff that lasted several hours as opposition leaders held talks with senior military officials in an attempt to ease Compaoré from power. Both opposition leaders and protesters on the streets have made it plain they would not allow any role for Compaoré. Hundreds of angry protesters gathered outside the headquarters of the armed forces following the president’s statement, many of them shouting “Blaise Leave” and “No More Blaise”. “We want Blaise Compaoré to leave. We want change,” said George Sawadogo, a 23-year-old student. The departure of Compaoré, a close military ally of the United States and former colonial power France, would be closely watched by other governments across West and Central Africa, where a number of long-serving leaders are reaching the end of their constitutional terms. Burkina Faso is one of the world’s poorest nations but has positioned itself as a mediator in regional crises. It is also a key ally in Western operations against al Qaeda-linked groups in West Africa. Amid uncertainty over how the army’s announcement would be received abroad, Ghana’s Foreign Minister Hanna Tetteh said in a tweet the country’s embassy in Burkina confirmed a military takeover of power. She declined to provide further details. Compaoré has ruled the nation with a firm grip but has faced increasing criticism in recent years, including defections by members of his party. He weathered a military and popular uprising in 2011 thanks to the support of his elite presidential guard. Diplomatic pressure had mounted over the past year for Compaoré to step down in 2015, amid calls from his own entourage for him to seek re-election, diplomats said. A letter from French President François Hollande to Compaoré earlier this month, seen by Reuters, offered France’s support in finding him a job with an international organization. Diplomats, however, say Compaoré has been concerned at the possibility of losing his immunity from prosecution, particularly in the wake of the trial of former Liberian leader Charles Taylor in the Hague. Burkina Faso, the fourth largest gold producer in Africa, has attracted several goldminers including TrueGold TGV.M, IamGold and Randgold Resources.